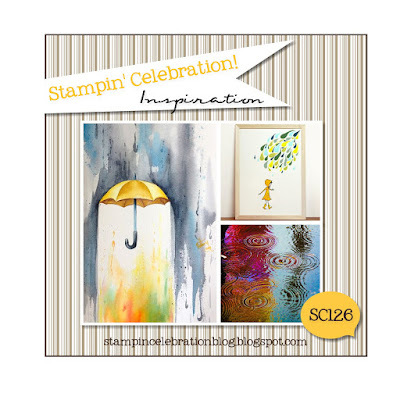 Stampsational: Dancing with Stampin' Celebration! Wow, April here in Chicago came in like a lion! I know it's supposed to be April showers, bring May flowers..., but the snow and wind this weekend made it feel more like early March rather than early April!! Anyway, speaking of April, I am loving the April inspiration challenge by Stampin' Celebration (SC126). The fun bright colors should help urge spring along! I was drawn to the the raindrop effect in the lower right-hand image and decided to try to make this come to life. I also liked the bright colors of the orange, yellow and green watercolored together so I also wanted to use this effect in my card! For the rain drops I started with a base of whisper white cardstock and used my Versa Marker to create the circles and then heat embossed them with clear embossing powder. Then I took some alcohol and a few drops of Daffodil Delight, Pumpkim Pie and Wild Wasabi reinkers and added them to alcohol. Then I used a medium sized paint brush to paint the colors on the card. I started with yellow, then orange and finally green. The sentiment is one from Tim Holtz (not Stampin' Up!). I love this sentiment and it fit perfectly with the theme! I heat embossed the sentiment with black embossing powder so I could watercolor over the sentiment. For the raindrops I found a semi-raindrop shape in the Pyramid Pals framelits from the Stampin' Up! 2016 Occasions catalog (I think it is supposed to be an ear). I just rounded the bottom and turned the ear into rain drops! Well, that's my card! Bright and cheery. I don't think the raindrop effect worked out all that well. I probably need some shading or something. But, it was fun to try! Can't wait to see what caught your eye!